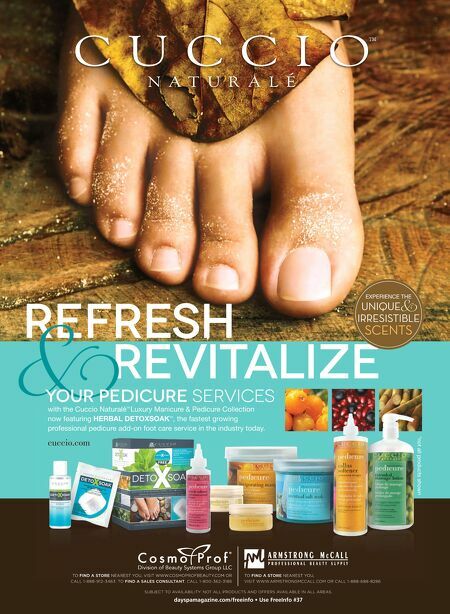 82 DAYSPA | AUGUST 2014 WINNING WAYS An Arizona salon and day spa serves its loyal community at every opportunity. 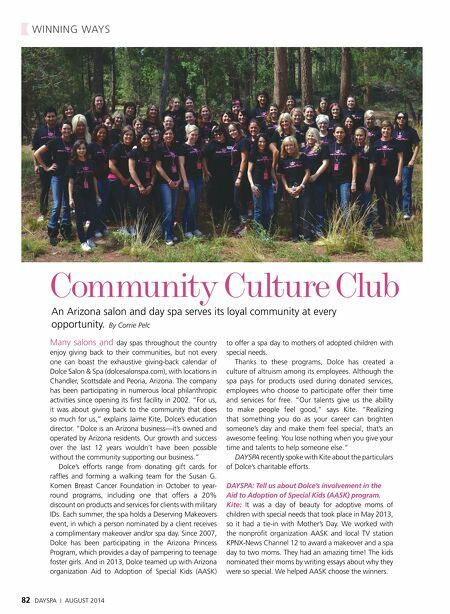 By Corrie Pelc Community Culture Club Many salons and day spas throughout the country enjoy giving back to their communities, but not every one can boast the exhaustive giving-back calendar of Dolce Salon & Spa (dolcesalonspa.com), with locations in Chandler, Scottsdale and Peoria, Arizona. The company has been participating in numerous local philanthropic activities since opening its fi rst facility in 2002. "For us, it was about giving back to the community that does so much for us," explains Jaime Kite, Dolce's education director. "Dolce is an Arizona business—it's owned and operated by Arizona residents. Our growth and success over the last 12 years wouldn't have been possible without the community supporting our business." Dolce's efforts range from donating gift cards for raffl es and forming a walking team for the Susan G. Komen Breast Cancer Foundation in October to year- round programs, including one that offers a 20% discount on products and services for clients with military IDs. Each summer, the spa holds a Deserving Makeovers event, in which a person nominated by a client receives a complimentary makeover and/or spa day. Since 2007, Dolce has been participating in the Arizona Princess Program, which provides a day of pampering to teenage foster girls. And in 2013, Dolce teamed up with Arizona organization Aid to Adoption of Special Kids (AASK) to offer a spa day to mothers of adopted children with special needs. Thanks to these programs, Dolce has created a culture of altruism among its employees. Although the spa pays for products used during donated services, employees who choose to participate offer their time and services for free. "Our talents give us the ability to make people feel good," says Kite. "Realizing that something you do as your career can brighten someone's day and make them feel special, that's an awesome feeling. You lose nothing when you give your time and talents to help someone else." DAYSPA recently spoke with Kite about the particulars of Dolce's charitable efforts. DAYSPA: Tell us about Dolce's involvement in the Aid to Adoption of Special Kids (AASK) program. Kite: It was a day of beauty for adoptive moms of children with special needs that took place in May 2013, so it had a tie-in with Mother's Day. We worked with the nonprofi t organization AASK and local TV station KPNX-News Channel 12 to award a makeover and a spa day to two moms. They had an amazing time! The kids nominated their moms by writing essays about why they were so special. We helped AASK choose the winners.